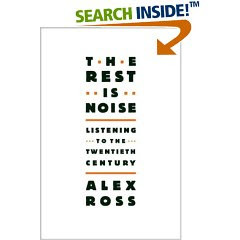 Bri Ribaj: Alex Ross: "The Rest Is Noise: Listening to the Twentieth Century"
Alex Ross: "The Rest Is Noise: Listening to the Twentieth Century"
Alex Ross' new book, "The Rest Is Noise: Listening to the Twentieth Century", seems to be a proper hit with academics and classical music lovers at large. The book is also reviewed quite generously by a number of blogs I read regularly. Ross attempts to contextualize the music of the 20th-century and while doing so he provides much cultural information. Impressive writing, no doubt. The Rest Is Noise: Listening to the Twentieth Century is a hefty 640 pages and reading from it while standing and sipping one's lunch, is not the easiest thing. However, it's worth some measure of time, especially if one is interested in knowing how to place music historically and culturally. I never got Schoenberg... Am I too challenged? Wait, isn't contemp Punk Rock a tad schoenberg-ian, though?